Camiguin is truly blessed with rich natural resources, and it has a lot of water-themed tourist spots that entice locals and guests alike to dip into pools and spend the leisurely time away from the hustle-bustle of city life. The Katibawasan Falls is located at the foot of Mt. Timpoong at Mambajao. There is a wide, parking area near the entrance where souvenir stalls vie for your attention to purchase shirts and trinkets. Upon paying a minimal entrance fee, a short walk to the falls increases your anticipation as you hear the roaring waters and catch glimpses of the falls between foliage and trees. The path eventually takes you to a ridge and beyond, a breathtaking view of Katibawasan Falls! It's a majestic sight! Measured at a drop of 250 feet, I have never seen a waterfall with such height! Cameras clicked feverishly as people scrambled for the best location. Actually, we did not intend to swim but the water was so inviting! And so take a dip we did. Eventually you get used to it somewhat, but then when you leave the pool, it's even c-c-c-c-c-colder-r-r-r-r-r-r. It made me wonder how the top of the waterfalls look like. It's amazing how the water topples off the mountain wall like it's coming from nowhere. It was beautiful, enchanting, and relaxing all at the same time. It was in the news: The Dark Knight broke box office records for first day ticket sales and weekend sales! Is it simply because of the late Heath Ledger that drove people to watch his performance? Well... I think that's one element. But the film is truly so much more. The Dark Knight is not your comic-book BatMan; this film version is definitely not for the average kid. I would describe this film as intense. Disturbing even, to a point. BatMan's "career" as a crimefighter was at its peak as organized crime finds its world getting cramped. As last ditch efforts are being made to salvage their fortune and lives, along comes the Joker whose solution to the problem was quite simple: kill the BatMan. What follows is a bizarre twist of events orchestrated by the Joker. I am reminded of my comment for the movie Hancock, where every superhero has a supervillain. In the Dark Knight, the Joker personifies super villainy! His actions were deadly and precise, underlying his calm demeanor. I cannot personally believe that it was the late Heath Ledger under that makeup. I remember him best from A Knight's Tale. His persona as the Joker was a complete character altogether. Indeed, I can say that he even outshone BatMan in this movie. The story of Harvey Dent was a delightful surprise. When we saw him flip a coin the first time, my friends and I gave knowing glances... that's Two-Face! Whoops... wait, is that a spoiler? Ummm... I actually didn't know Two-Face was going to be in this movie because he wasn't mentioned in the trailers at all, and the posters displayed in cinemas were just about BatMan and the Joker. It was really a surprise for me to see him played in the movie. His was a passion that overtook his sense of loss over his sense of justice. For this second installment, the characters were complex and engaging. The Joker, most especially. And of course with a clown around, expect a few laughs. It was madness, that Joker. The audience laughs while he tries to bombard an armored truck to smithereens. Is that suppose to be funny? Maddening, isn't it? Ok Ok... I really can't skip out the spoilers but I'll make a couple more in this paragraph. It was a surprise as well that the BatMan left Gotham City on a mission. Well, I have grown accustomed to having BatMan stay always in Gotham City that it was really a surprise that this fictional city received a "reality treatment". And the BatMan fan club! That was a riot. My only gripe is that BatMan's hoarse voice made me want to clear my throat, and we were actually speaking like him already when we left the cinema! Also I wonder if Two-Face always had Eye-Mo handy. If you're going to watch the movie, take your wiwi break early on; it's about two and a half hours long and the story moves along quickly; you can get lost if you miss out on a couple of minutes. Engaging story with lots of human drama, lots of action, cool car and bike! This movie is well worth the wait. In the mid-90s, I became fascinated with toys from my unforgettable 70s and 80s years and amassed a considerable number of action figures (they're not toys, they're action figures!). I did not play with them though, just the joy of being able to find these and display them in the living room gave me enough satisfaction. I even bought some with boxes kept intact because I dreamed that I will be putting up my very own toy shop ten years hence. Well... it has been ten years. Time does fly when you're having fun! I contemplated about selling some of my action figures because ever since I transferred apartment and had most of my things hauled off to Baguio, my collection has been all over the place. 75% of my display cabinet's glass panels were shattered and so I had to keep most of them in boxes and containers. I still have some of them here in Manila, actually. But early this week, while sorting them out, I can't part with many of them. The Macrosses, the Autobot Jetfires, the Dragonballs, a vintage Voltes V, a Soul of Chokogin Mazinger Z, various Star Wars items, 80s Transformers ... many of these have sentimental value. The various components of this model kit has never been removed from their plastic bags. All decals are present and unapplied. This kit has metal parts. Though the silver coating has dropped off in some areas, there is no rusting whatsoever. This is the Soul of Chogokin Mazinger Z Black. I had the metal body displayed in the cabinet with the original color Mazinger Z. I did not assemble the arms. The only thing I removed from the package is one of the the Hover Pileders which I docked onto his head. The rest of the parts remain sealed and unassembled. Includes the die cast metal Koji Kabuto figure (below right). Do you recall the 80s cartoon SilverHawks? I think it was about the same time ThunderCats were shown. I'm selling mine, still sealed in its blister pack. I Googled this figure and found out that it has become quite a collectible item. Usually, the figure is sold without the box (called loose figure in toy collecting circles), and Tally-Hawk is either not included or sold separately. This is a more recent acquisition, the super-deformed version of Gundam Wing: Endless Waltz's Heavy Arms. I had a huge fascination with Macross. The model kit below was one of my purchases which was never assembled. I have a couple of die-cast metal versions which was released in the 80s. All parts still intact, awaiting assembly. There are some metal components as well. Lastly, here's the Voltes V De-Classified Book, never opened, although the plastic seal has already torn up at the upper part. I'm still thinking about where to advertise these to sell... if you're interested though, let me know. I will be advertising them in trade websites soon. Remember, they're not toys... they're action figures! Have you been waiting for Wall-E to arrive at the big screen and wondering how come he hasn't arrived yet? You're not alone. This has got to be the most-delayed, highly-anticipated movie ever. So what's the next-best thing without Wall-E on film? 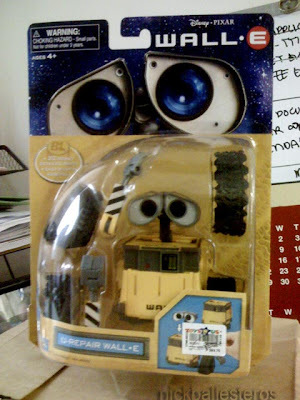 Wall-E on plastic. Toys, that is. We made our rounds at SM Toy stores one time, but wasn't available yet. However, I chanced upon online articles stating that toys are already available at Toys R Us. Lucky us, we have an outlet here in Manila (specifically at Robinson's Galleria). And lucky me, I was in the area last week. 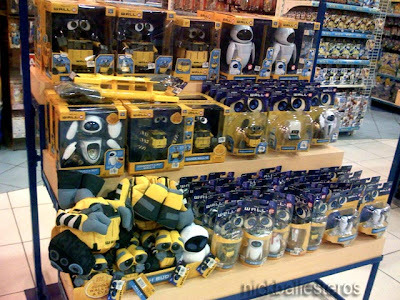 Lo and behold, Wall-E toys galore! Prices range from 300+ to 2,000 pesos. 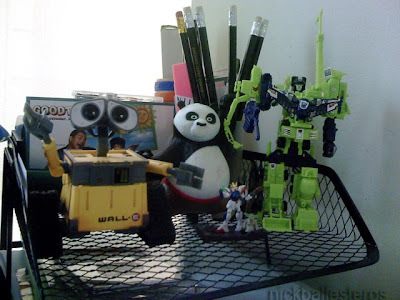 I bought a U-Repair Wall-E (this one's 300+) to adorn my office table. Just the right size to be inconspicuous! And I like the detail on this toy! Wall-E, meet Po, Devastator, Gundam, and Yoda. And one time, we had dinner at Glorietta and the food left an aftertaste (think sinigang na tuna, but the tuna was no longer that fresh. Ugh). So we scouted around for something sweet. Lo and behold! 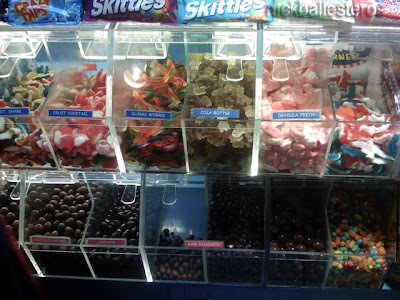 Sweets at the Candy Corner! 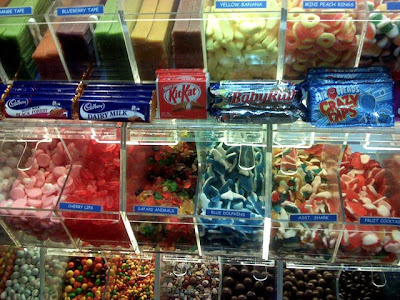 Sweets are sold at 100 grams each. You can get a little bit of each until you reach the desired weight. Nice concept, huh? 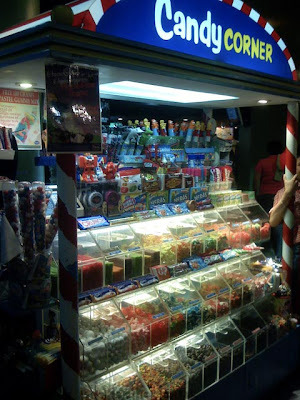 Actually I have been buying sweets and jellybeans from them ten years ago but they get gobbled up quickly at the office... this is a sort of re-captured delight. I brought a pack home to Baguio which I gave to Jo-Lo. He asked for it to be opened and he was happily rummaging through the Gummi Bears and the Blue Dolphins and the Mushrooms when he suddenly did a double-take and returned the pack to us. He got a worm! Hahaha. He liked the strips (ahas! ahas! he said and proceeded to eat anyways); my wife and I gobbled up most of it. Here's to the kid in all of us. Jules Verne is truly a visionary. He lived in 1828-1905 way before "modern travel and transportation" was available, and yet he told stories way ahead of his time. In "20,000 Leagues under the Sea", he narrated the exploits of Captain Ahab in his submarine and diving equipment to explore the ocean depths... but these were yet to be invented! His other works include Around the World in Eighty Days, and the latest movie adaptation, Journey to the Center of the Earth. Indeed, he pioneered the science-fiction genre. I have not yet read the book actually (though I'm inclined to buy one because I enjoyed 20,000 Leagues), but I read in other reviews of this movie that it is a loose adaptation of the book. It is an adventure created by following the clues in Jules Verne's book on how to go to the Center of the Earth. Professor Trevor Anderson taught Earth Sciences in a university and headed the Center of Volcanic Activity. Prior to Trevor's leadership of the center (of which he only had one assistant, his older brother Max took charge and placed monitoring systems in strategic places in the world ten years before. At the lowest point of Trevor's career, the Center was on the verge of getting closed down and only three of the many monitors were functional. But one day, while Max's son Sean was on vacation with uncle Trevor, they noticed a fourth monitoring device spring to life. The instances of that time were the same as the circumstances ten years back when Max disappeared. Determined to know what happened to Max, Trevor and Sean embarks on a journey to Iceland and hires mountain guide Hannah (Anita Briem) to check on the monitor. A thunderstorm forces them into a cavern and subsequently gets trapped. Their adventure to the center of the earth begins. Brendan Fraser is one actor whose movie career I was able to follow principally because he starred in adventure / fun films. Think Encino/California Man, George of the Jungle, a movie where they live underground (forgot the title), The Mummy, etc. Fun movies all. He disappeared from the big screen for quite a while and is now making a big comeback through this film and a third installment of The Mummy. As the professor character Trevor, Fraser did his part well although his acting and humor is what you would expect from watching too many of his films. I don't know about Anita Briem, though. As the love interest of Brendan, I did not see any spark, and did not click with the audience overall (unlike the chemistry with Rachel Weisz in the Mummy series) but she did fine as an outdoorsy lass who knows the ropes of trekking. (Speaking of which, we sorely missed doing our own trekking and spelunking adventures while watching this movie). As a kid who has never read the book and now finds himself in it, I find that Josh Hutcherson as Sean did not truly bring to the screen a sense of wonderment and surprise at being in such an otherwordly environment. Other than these, the plot was simple enough. But it's the adventure that made the grade. From the start the trio gets trapped in the cave up to the last part, it was an awesome trip! I noticed that the manner by which it was filmed was suggestive that it was done for a 3D movie, with things flying about and action scenes in the first person perspective. My hunch was justified when I learned that there is indeed a 3D version of this movie. It would have even been more wonderful to watch it on 3D! Too bad The Block and iMax is too far from us. I loved the movie because it was fun and a nice adventure overall. And it makes me want to pick up the Jules Verne book the next time I visit the bookstore. I have been hearing about the Sunken Cemetery in tourist documentaries but have never found it interesting because for one thing, it's a cemetery! Diving into the cemetery sounded a lot like a spooky adventure to me. But when a friend said that they were planning to go to Cagayan de Oro and then to Camiguin Island, my curiosity got the better of me. Why not? This can be the chance of a lifetime! Plus, there was a local movie named "Ouija" which featured beautiful Camiguin Island and the Sunken Cemetery. Suspense/horror theme notwithstanding, the scenery was enough to get anyone curious about the island. We rented a jeepney to take us to the tourist spots, and the Sunken Cemetery was our final destination for that day. We wished to see the sunset there. As we descended the narrow steps towards the shore to take a banca ride going to the cross itself, there were a couple other local tourists about. And just like them, we were wondering where the film Ouija was shot. Wow, that film must have been very popular. As our banca crossed the quick, less than 5-minute trip, I was half-imagining decomposing hands grasping the boat's edge, overturning it and dragging us to their watery grave. *shudder* Blame it on my increasing fascination with suspense/horror films. We finally reached the cross and lingered about for some time while our other companions made their way as well. The water was crystal clear; you can actually see portions of the bottom. But the sun as already setting which created shadows beneath us. We returned to the mainland just as the sun started to set. It was a beautiful sight ... for a place that met a violent end with a volcano's unleashed fury. The story is about Hancock, a "bum" who craves for alcohol morning, noon and night, and does not care much about life in general because he's an immortal and has been in the planet for the longest time (although he can only recall the last 80 years). But when crime is afoot, off he flies to save to the day. Problem is, his intoxicated body causes so much destruction than a "regular" crime solving method would have done that the millions of dollars lost stood out more glaringly than the "heroic" act that the people of Los Angeles pretty much doesn't want him around. The first half hour of the movie successfully introduces Hancock as a "professional bum" who doesn't really care about anything at all but since he has these superpowers and he has a teeny weeny bit of a conscience as he tries to understand why he was that way, he helps out resolve crime in his... well, unique way. He does it whether they like it or not. However, the movie's strong plot somehow decelerates when the concept of immortality is revealed. I know this is supposed to be fiction and anything can happen in fiction, right? but still... immortals meeting and speedily losing their powers and eternal life because of this contact? I don't buy it. So there were a lot of immortals in the distant past but they all started to die off because they are eternally attracted to each other... if this is so, where did they come from in the first place? Sketchy, that part of the plot is. Also in superhero stories, there is a supervillain that is just as memorable, if not even more popular than the superhero itself. Superman has Lex Luthor, Batman has the Joker (among others), Hancock has... see? I forgot the name. It was just some regular bank robber who wanted revenge. Given this rather blurry concept of Hancock's origins and concepts about their race, I enjoyed the first hour, but left me thinking it could have been better by the second hour. Can you bend bullets? If so, you're one of the lucky few in the planet who can do so, and you can become a member of the Fraternity! The movie centers on the humdrum life of Wesley Gibson: an office employee whose existence is tormented by constant stress from life and work. And just as he thinks that this is all there is to his life, he learns that he is the son of an assassin, and that his father was recently killed and he was being recruited to avenge his father's death. It turns out that the stress symptoms he was experiencing was actually a manifestation of a rare ability: the blood rush enables him to be more alert, quick, and sensitive to his surroundings, performing extraordinary feats that are close to being superhuman. What follows after he leaves office life with a bang is a life of violence and brutality as he is trained to harness and control his power, and he learns to kill without regret. The Fraternity is a group of assassins that has survived for centuries, killing indiscriminately as dictated by Fate itself. Kill one, save thousands. That's their motto. Although I don't exactly feel like getting orders from a weaving machine. Oops, one spoiler out. So how easy is it to bend a bullet? Easy. Shoot your blood pressure to an unbelievable high that it zaps through your brain, enabling you to see things in slo-mo, and with designer bullets and a signature move that defies physics, the bullet will hit the mark in a trajectory. And while you’re at it, why not do ravishing stunts with your car? They’d call it bullet time, I call it surreal. There are a lot of things in this movie at are not at all possible in real life. It’s impossible! It’s surreal! And I love it! I went in the cinema a bit skeptical (the trailer was too much I think, but Angelina Jolie was in it so what the heck) and we came out with an adrenaline rush! Never a dull moment. A couple of laughs, a lot of jaw-dropping action scenes, and with a nice twist to the story. PS. I learned that this is a loose adaptation from a comic book. Save for 300, I think loose adaptations are becoming a trend. I wonder to what extent do the creators agree to having their work revised?